Homemade Pizza and Blueberry Cake too! Mexican and Ice Cream = Fabulous Friday! 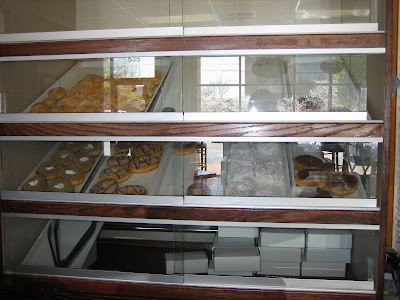 White Windmill Bakery - Quite a Treat! 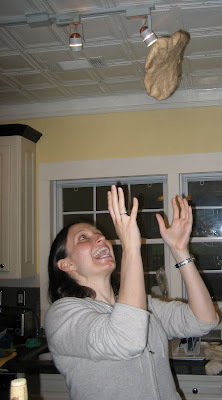 Yours truly tossing the whole wheat crust. Friday evening I was invited to dine with friends at their place. We made our own pizzas, which was fun as well as delicious. We also had a healthy and tasty salad to start. 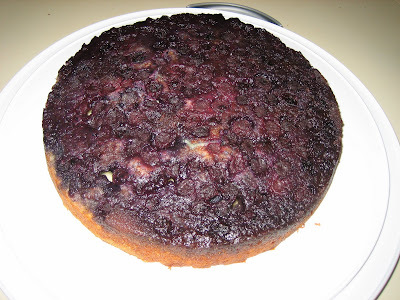 For dessert I made and brought blueberry upside down cake, a recipe I procured from Rebecca over at Foodie With Family. Although her recipe calls for cranberries, she also mentions that blueberries are a good substitute. I used a frozen bag from Trader Joes, which made 2 cakes (I doubled the recipe). I also added a smidgeon of cardamom instead of the nutmeg. This cake is easy and delicious! You simply must try it. I am thinking about using other fruits with this also - pitted cherries or other berries would work great. I think apples might be good too but Rebecca suggested cooking them first before arranging them in the pan. 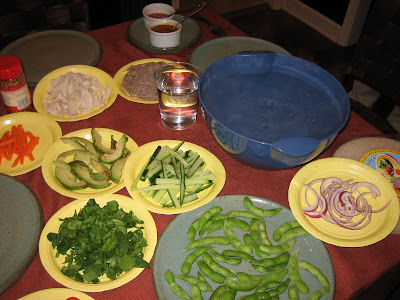 We had a great time cooking and eating this homemade meal and we even talked about blogging. Dawn has started her own blog about books - her goal is to read a book a week. Catch up with her progress and read along here. 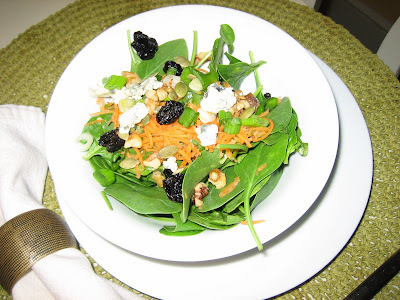 Spinach salad with cranberries, walnuts & cheese. Various toppings ready to be applied to the dough. All done! We did 1/2 with tomato sauce, olives, red peppers, mushrooms and spinach, 1/4 with pesto, mozzarella and fresh tomatoes and 1/4 with red pepper puree, broccoli and spicy turkey sausage. 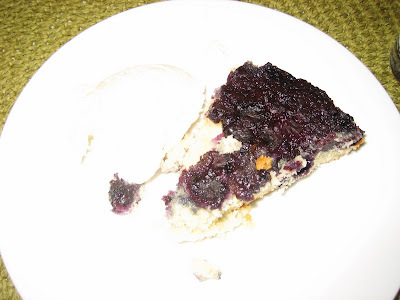 Blueberry cake, heated and served with vanilla ice cream. 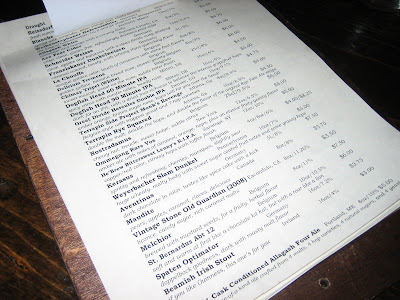 Beer Menu - it goes on and on! 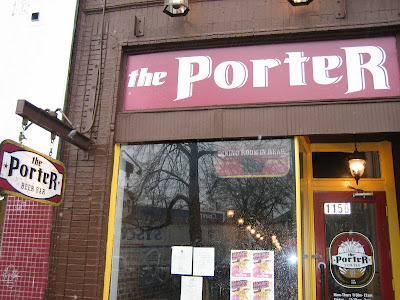 On Friday I met a friend for lunch at The Porter Beer Bar in Little Five Points. I felt like we had been transported to an English pub - they really have achieved a special atmosphere! 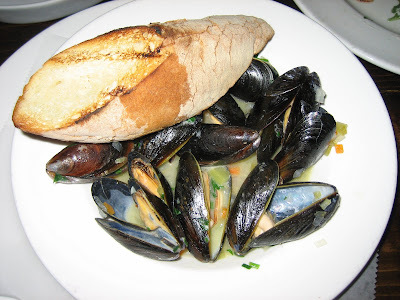 We shared the arugula salad and Belgian fries and each ordered mussels. 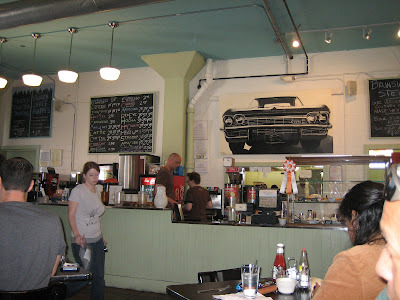 All was very good, especially the garlic smothered fries and the pickled beets in the arugula salad. The mussels were quality also, although I felt the broth could have been spicier as the garlic fries really overpowered them. 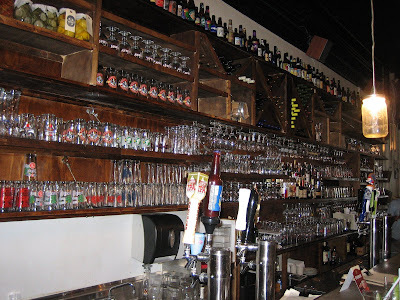 Although we abstained from any alcohol during working hours, their beer menu is incredible. I must return to try one of the ciders or chocolate inspired ales. The dessert list also looked good - including a chocolate ice cream made with beer. 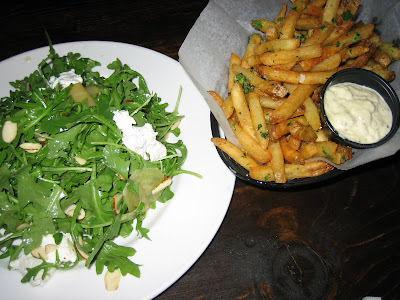 Arugula salad and Belgian garlic fries. 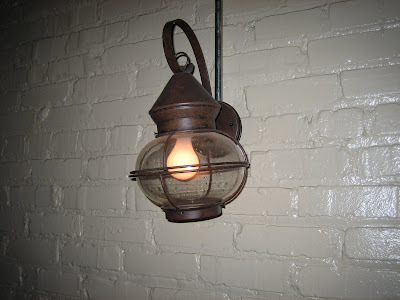 This place has a real pub atmosphere - I felt like I was in England with the dark halls and faux lanterns lighting the way. Here's how you'll know it! 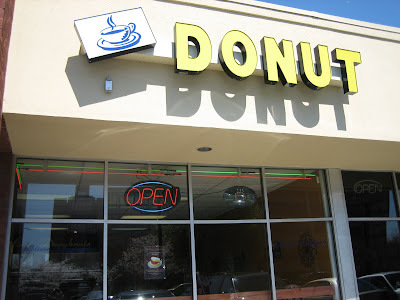 I was in the neighborhood so I thought I'd check out Sublime Doughnuts. While I'm not the hugest fan of doughnuts, I think a perfectly fresh doughnut can be very enjoyable. I was pleased to hear about this place in the AJC recently. I tried a bite of the three confections pictured below. The peanut butter cup was definitely sweet, with lots of good ole PB. I enjoyed the Boston cream pie although the cream was lacking - maybe someone forgot this one? The raspberry also wasn't full of much berry. I'd like to see more filling going in these doughnuts. Still, they were all very tasty and if I'm driving past this place again, I'll be tempted to stop and grab one. Go out and support this entrepreneur next time you're in the mood for doughnuts! 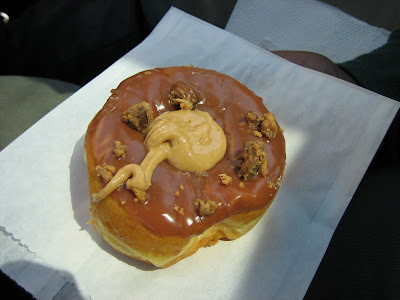 Peanut butter cup doughnut - yes that's straight peanut butter on top! 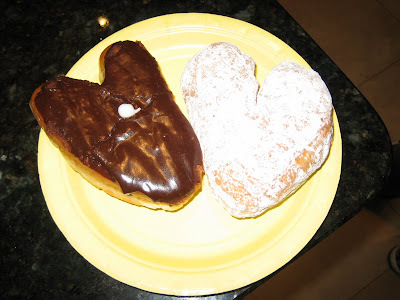 Raspberry filled doughnut with powdered sugar; Boston cream pie doughnut - don't you love the heart shapes? I almost took a photo of the huge crowd out front! 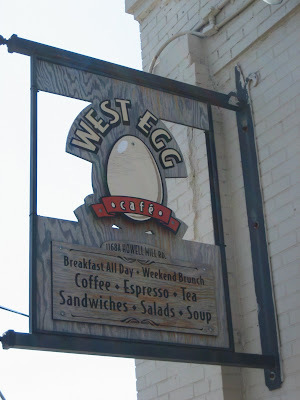 Sunday I tried West Egg Cafe, a cute brunch/lunch spot on the west side of Atlanta that I'd heard really good things about. The only bad thing was the wait. I called ahead to see if we could get on the list, but they said that "hadn't worked out well" in the past. We waited for about an hour after arriving around 11:45. Next time I'll be earlier, although we were late because of a run at the track. Gets you very hungry to run some miles before eating. 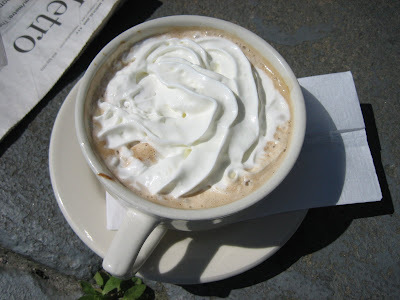 In any event, I enjoyed the pictured mocha while waiting for a table. Once we sat down, we ordered quickly and the food did not take too long. 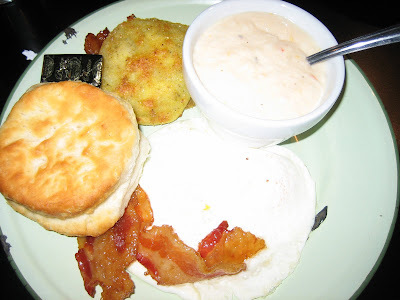 I tried the Peachtree plate: 2 eggs, bacon, pimento cheese grits and fried green tomatoes with a biscuit. All I can say is DELICIOUS! The bacon is basted in something sweet - maybe honey, and the grits were phenomenal. 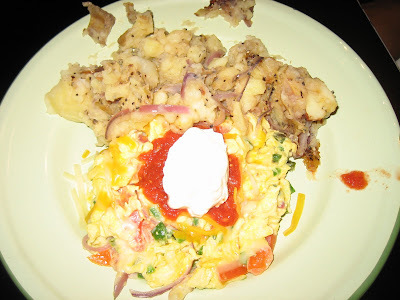 I tried a bite of the huevos tejanos with potatoes and that was awesome also. Both of these dishes were ordered off the specials menu. 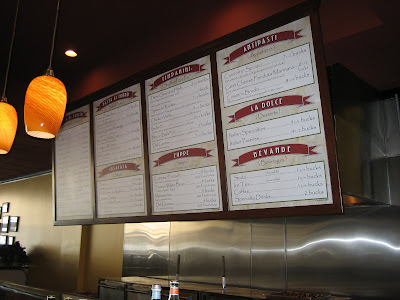 There is also a nice lunch menu - some of the sandwiches I saw looked tasty. 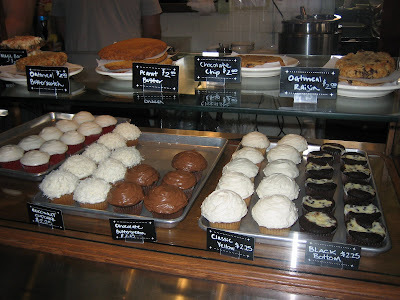 Behind the counter there is a display of giant cookies, cupcakes and other goodies. I held back this time but I'm dying to try their Coca-Cola cupcake, which has apparently won some awards. Selection of cupcakes - I restrained myself this time! 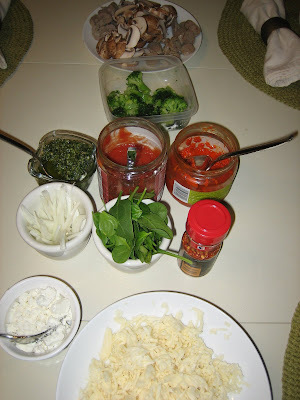 From my Grandma Sarah, I learned how to make this delicious sauce that is tasty over any fish or on chicken as well. 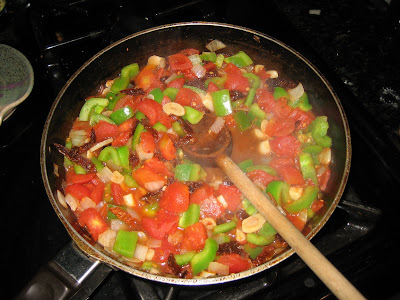 Chop 1 green pepper, 1/2 onion, and as much garlic as you'd like (I used about 10 cloves) and combine with a can of diced or stewed tomatoes (or chopped fresh tomatoes if they're in season) and sautee over medium heat in a couple tablespoons of olive oil. Add sun dried tomatoes if desired as well as salt, pepper and any other spice you'd like to try. 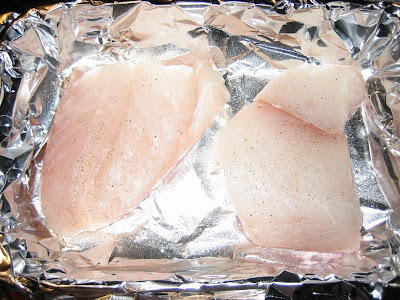 Arrange the fish in a baking dish (I always put aluminum foil in first to avoid a messy cleanup) and sprinkle with salt and pepper. Pour sauce over fish and bake at 350 until the fish is cooked. The length of time will depend a lot on the thickness of your fish. For this red snapper, which was quite thick (bought frozen from Trader Joe's), it took about 40 minutes. I served this with quinoa and it turned out well. Somehow I neglected to take a photo of the finished product. Just think of the second photo on top of the first! Red snapper fillets, defrosted and sprinkled with pepper and sea salt. 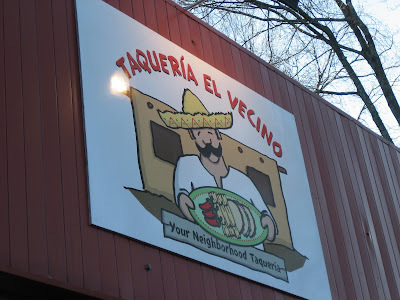 Friday I ventured to Taqueria El Vecino, a small, casual Mexican restaurant in the Oak Grove section of Decatur. There was a short wait, with many families and groups dining here early evening. Apparently the restaurant is putting in a deck in the parking lot so there should be more seating soon. 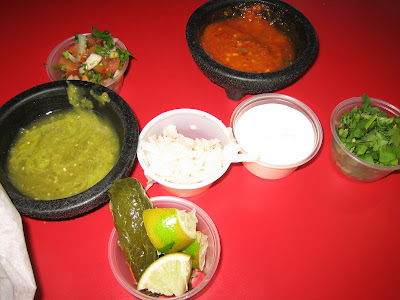 A neat feature is the salsa bar (several selections featured below) where customers can sample 5+ kinds of salsa as well as load up on extras like roasted jalepenos, marinated jicama and preserved onions; lime and sour cream as well as some other dressings and sauces. The chips were unremarkable and while it was fun collecting and mixing salsas (and some were really hot), the flavors didn't stand out as exceptional. For entrees we tried the bistec a la Mexicana, steak sauteed with onions, tomatoes and jalepenos, served with corn tortillas. The tortillas here are different, with a really earthy flavor. A second entree we tried was a combination plate with a chicken mole tamale, a fish taco and a pork taco. The tacos were unremarkable, the fish lacking much seasoning and the pork tasted as if it had been sitting for awhile. 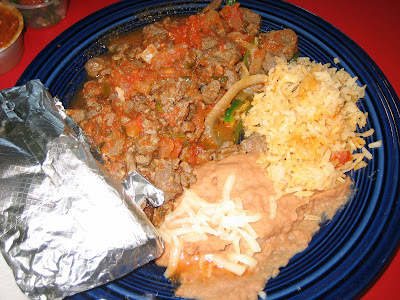 The addition of salsas (especially the pico de gallo) helped, but the meat itself didn't have a lot of flavor. The tamale was tasty and unique, freshly baked in a husk. Prices here are reasonable, but this isn't a place I plan to return. Still on the hunt for Atlanta's best Mexican. What's your favorite? Selection from the salsa bar. 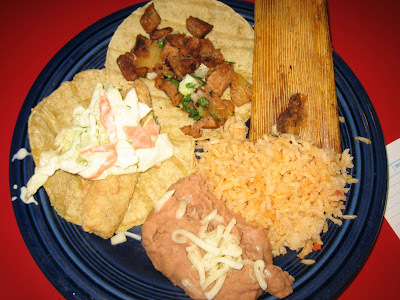 Combination plate with fish taco, pastor taco and chicken mole tamale. 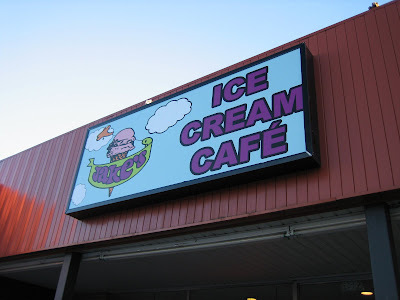 After dinner, we noticed Jake's Ice Cream Cafe conveniently located just a few feet from Taqueria El Vecino. Jake's ice cream is unique and I enjoy their interesting falvors - red velvet cake, carrot cake and (my current personal favorite) Delta's Delight - crafted for Delta airlines, it contains Biscoff cookie bits, caramel swirls and Bailey's Irish Cream. Let me tell you, it's worth a try. The ice cream here has a different consistency to me, and I like it! The vanilla based flavors are very creamy if you like actually tasting that pure cream flavor. The chocolate raspberry truffle was also tasty, although it overwhelmed the vanilla based flavors when you eat them together. 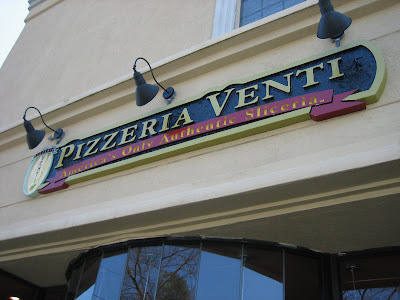 The Lenox Road location that was formerly occupied by Cedars is now Pizzeria Venti. I tried it on Wednesday with some co-workers. Hungry as I was, I forgot to take photos of what we actually ate but I managed to take a few around the restaurant afterwards. You order at the counter and then a server will bring you your order. Drinks are self-service, although several times someone offered to refill our beverages. Seating is plentiful, with tables in the front of the restaurant as well as a small room in the back. We were practically the only people there, and the service was particularly attentive. We shared the field green and apple salad, which was tasty. 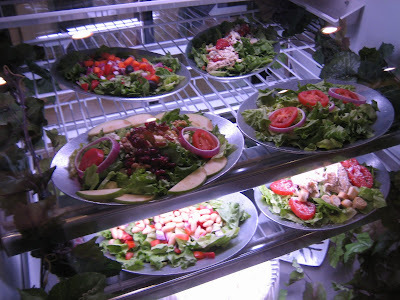 Actually the entire salad selection looked good and I noticed a specials board with a strawberry fields salad (details on their website). The pizza here is in rectangles - one per person would be enough for lunch. We tried a slice that had a sliced tomato in the middle as well as a slice with bacon. 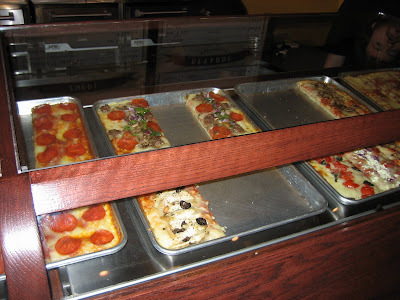 Additionally, we shared the chicken venti Timpanini, a round of pizza dough baked with toppings stuffed inside. It's supposed to be served with Alfredo sauce, but I requested marinara instead. They also serve baked pastas, soups (only in winter) and have a wine list. 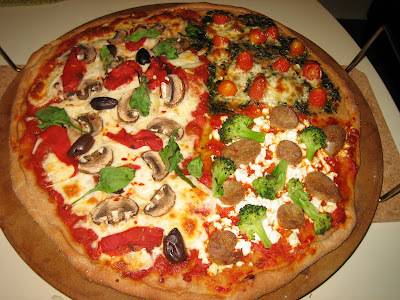 The food tasted good, although this is not my favorite kind of pizza, the dough a bit too gummy or chewy for my taste. I prefer thin crust, what can I say. I really did enjoy the salad, though and on our way out we sampled several of the gelato selections, which are shipped in from Michigan. I would probably come back just for that!! The Timpanini was also tasty and I want to try their "bocce balls" - meatballs wrapped in pizza dough. This is a fine place for a weekday lunch or casual dinner. Their website includes information on a weekly Wednesday night special. Long, rectangular slices of pizza. 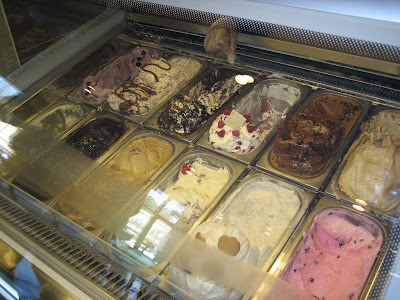 Gelato case - several great flavors including a deep dark chocolate on the bottom left. Roasted jalepenos, chips, slaw & sopes. This is what I call getting the most for your money. 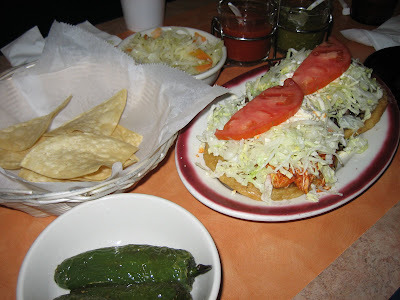 On Sunday at Rincon Latino we ordered plantains with sour cream (delicious), two pupusas, and two sopes. Our total bill, with tip, was just at $15. The restaurant offers complimentary roasted jalepenos, which went very well with the sopes - watch out, though, they're hot! When they bring the check they also offer cajeta lollipops, which are delicious. Definitely a worthy BuHi spot to try. The decor is very simple and some of the waitresses don't speak much English, but their menu is in English and they are very helpful about finding someone to answer all questions. 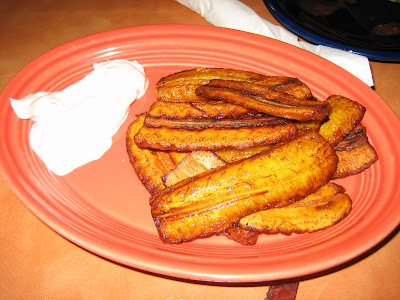 Fried sweet plantains with sour cream. 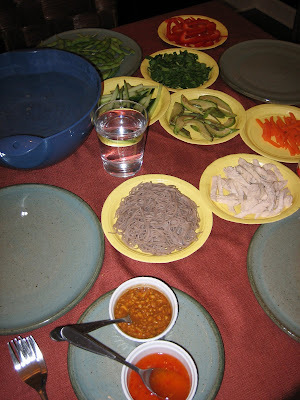 On Saturday I made fresh spring rolls with poached, sliced chicken, avocado, spinach, carrot, cucumber, red pepper, onion & soba noodles. 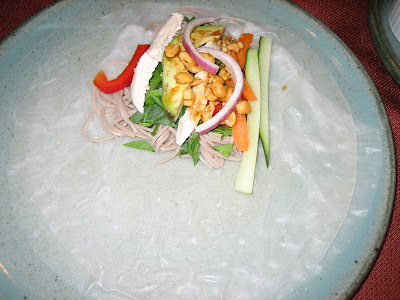 It's fun using the wrappers that come as solid, hard discs that are softened in warm water immediately before rolling. I made the peanut sauce with lime juice, rice vinegar, sesame oil, garlic & soy sauce and used the leftovers to make a soba pasta salad. The other sauce is a sweet chili sauce. 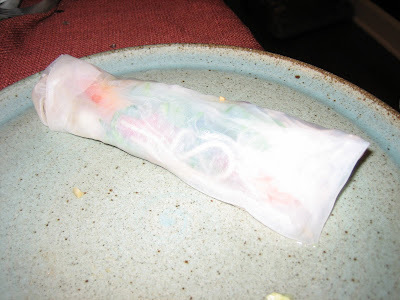 Another shot of the ingredients and sauces as well as the warm water used to soften the wrapper. 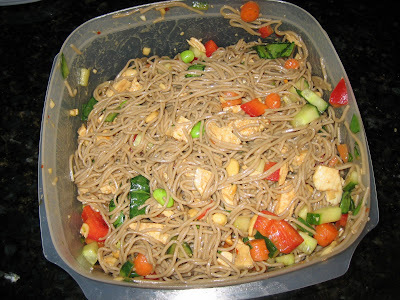 Soba chicken, veggie & peanut salad made with the leftovers. 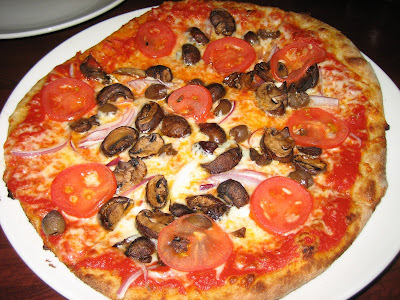 Friday I dined at Stella Neighborhood Trattoria on Memorial Drive. The menu is quite similar to sister restaurant Osteria 832 as is the food quality. I enjoyed everything, particularly the bruschetta, which contained the perfect olive oil, balsamic, garlic combination to render the tomatoes, basil & toasted bread simply divine. The pasta and pizza dishes were tasty as well. This is good, simple food in a casual atmosphere, very kid-friendly. After dinner we headed to Morelli's Ice Cream, one of Atlanta's best in my opinion. I tried the ginger lavender flavor - delicious - and stole a few bites of chocolate peanut butter swirl. The ginger and lavender really came through to make it a robust flavor. The chocolate peanut butter has huge chunks of PB in it, which is a little much for me but die hard fans would love it! Other unique flavors include jalepeno coconut and sweet corn. Morelli's is very convenient to or from Starlight Six, Atlanta's drive-in movie theater. 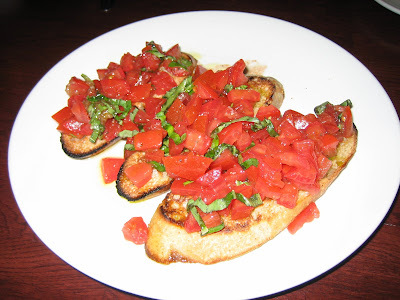 Delicious bruschetta with real garlic flavor. 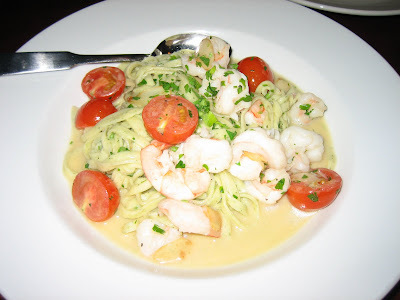 Shrimp scampi pasta with parsley and tomatoes. Veggie pizza - nothing fancy, but tasty nevertheless with a simple, plentiful tomato sauce. I don't like it when the sauce is invisible!